Due to the fact that Kightswich Shopping Centre will not offer us a long term contract to stay at 21 Kightwich, with the security that we can stay there for the forseable furture, we have decided to up sticks and move on. We will be moving to new larger purpose built premises down along the sea front, on the brand NEW casino parade. We have been able to completely redesign our showrooms from a blank peice of paper. It is so bing that we intend to build a full sized orangery inside. We will be moving in Janurary 2013, but since these are new units our new address is yet to be confirmed. The result of months of work is a fantastic, dynamic and stylish user interface with a functional and sophisticated back end program. 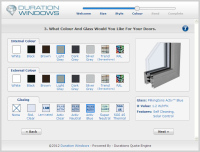 The new estimator gives and online discount and is now the fastest and cheapest way to quote of bi-folding doors. You could save up to as much as £285 when doing quotations online. It is due to be launched 21st November 2012. Introducing Durations own Royale Steel Replacement Windows. They are designed to exactly replicate traditional steel windows and have an outerframe depth of just 32.5mm, making them quick and easy to install when replacing your existing steel windows. Our Royale Steel Replacement Windows are now the slimmest thermally broken aluminium window system on the market. 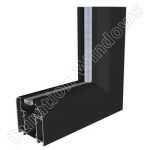 Designed as a secure and thermally efficient replacement for steel windows. Using the latest inline polyamide thermal break and Krypton gas filled 16mm sealed untis to maximise their thermal performance. Due to popular demand Blyweert Beaufort and now offering a range of colours at a reduced cost and lead time, when compared to special RAL colours. This comprehensive range of conventional colours includes a white gloss, a semi-gloss graphite black, an anthracite matt grey, an semi-gloss dove grey (light grey), an semi-gloss ivory cream and a van-dyke semi-gloss brown. This colour range provides something for everyone and will cover most eventualities, and does so for a far reasonable price, infact for Bifold Doors these colours are currently the same price as white. Our NEW Slim-line Equal Leg secondary glazing system is now the slimmest secondary glazing system that we offer, and unlike our Luxury Subframe System it has no need for a wooden subframe. This is an all aluminium system and it comes with optional high performance insulating foam for improved acoustic and thermal properties, which not only reduces draughts and noise. The outerframe has either a counter sunk fixing grove for hiding the screws when face fixed or a flange or lip that sticks out the back for reveal fixing. Available as horizontal sliders, vertical sliders and lift outs. Our sister company ABD have been manufacturing high quality aluminium roofs since 1995 and are well known for their popular roof lanterns. Their system is highly versatile and can be used on even the most awkward roofs. This tried and trusted roof system has given years of great service, but they have decided that it was time to completely re-design their roof to clearly establish ABD as the market leaders. They have completely re-designed the roof from scratch starting from the ground up. They have retained only the best features of their original system, while working to improve the roofs thermal performance and make it more fitter friendly for their customers. The new roof has now been launched in lean-to styles with others due to follow on October 1st 2012. As London is turned into a huge sporting and cultural venue for the Olympic Games, we wish team GB all the best of luck, and hope for a fantastic and successful Olympic Games. We do however need to take the oportunity to prepare and think about how this will affect our deliverys, especially deliverys to in and around London. We are giving advanced warning that this will effect London's road networks. The London 2012 Games will be centred around the Olympic Park in east London, which is the site of a number of new sports venues. Deliveries scheduled for during the London 2012 Olympics, may be affected by transport restrictions and extended travel times, as spectators flock to the centre of London. Commercial shop fronts and entrances are no longer part of Duration Windows product range, all commercial systems are now to be manufactutred by our sister company Aluminium By Design (ABD). Since the October 2010 building regulations our Smarts Shopline system has been uncomplient to the replacement and referbishment part of the building regulations Doc L part 2 B and therefore only suitable for New build non-dwellings. Aluminium by Design have decided to start manufacturing a New Smart-Wall system, which is thermally broken and can achieve U values of 1.8 w/m²K. They are therefore now far more equipt to handle equiries for commercial systems and we have decided to hand the battern over to them. The Duraslide 2000 is suitable for residential applications and can be installed into new or existing timber subframes or direct to brick. It is highly secure and achieves excellent U-values inline with the current Building Regulations. These aluminium patio doors have been design to be suitable for use as replacement doors in existing buildings as well as for installation into new buildings. The Duraslide 2000, is the latest addition to our popular Duraslide range of elegant, modern and aesthetically pleasing sliding doors. The Duraslide 2000 offers a double or triple track option and some nice additional features over the 1000 series. The 2000 is extremely versatile and can have 2, 3 or 4 panels, all of which can slide. Despite the advantages of the 2000, it is still a very competitively priced patio door. Have you ever had problems de-glazing a window with astragal bars? Our NEW fitter friendly Clip-on astragal bars are quick and easy to fit and quick and easy to remove. A PVC backing plate is securely glued to the glass unit with a quality tape specially chosen by us for it's high quality and suitability. The A-shaped bars are designed to be clipped on to the backing plate and securely held in place. The bars can be removed by the window fitter if the window ever needs to be re-glazed. Our Putty-line Windows are the perfect solution for replacing old putty glazed steel windows, with it's authentic 45° angled putty-line design. The window has been specially designed to replicate the appearance and slim sight-lines of traditional steel windows, whilst offering high security, weather and thermal performances. They use the latest 'Polyamide' thermal break technology and double glazed gas filled sealed units to achieve excellent U-values. The Duraslide 1000 is a single track residential aluminium sliding patio door from Smarts Systems. Designed as a replacment for old aluminium patio doors, it can be installed into timber subframe's or directly into the traditional aperture. It has a modern design that is highly secure, achieving U values as low as 1.6 to exceeding the current Building Regs. They boast competitive prices, clean looks, a wide range of standard colours and they can even be painted in dual colour (different colours inside and out). They are aesthetically pleasing with equal glass lines and slight-line profiles. These Monarch Sash windows supersede the old Monoframe vertical Slider and provide a market leading level of thermal and weather performance in aluminium sliding systems. The system is internally beaded to allow for ease of site installation and facilitate sealed unit replacement. It features multi chamber profiles and a unique polyamide design. It achieves a Window Energy Rating of ‘C’ to comply with doc L 2010 - without the need for complex and costly sealed units or foam filled profiles. Monarch slim-line patio doors are back. These new ‘Crown 98’ Patio Doors have been designed as a direct replacement for old Monoframe patio doors. 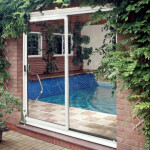 Sapa's Monoframe was arguably the finest residential aluminium patio door system on the market for well over 20 years. This is why Duration Windows have come together with Sapa to create and modify the patio door in order to keep up with the ever increasing building regulations and have not only meet the regulations, but exceed them... whilst still maintaining a beautifully slim set of patio doors. Last year due to supplier issues our Continental Bifold Doors increased in price and lead times. Due to demand we are increaseing stocks and reducing the price of RAL 7016 Matt, Dark Grey to be the same price as white. Happy Easter from Duration Windows! For a limited time only we have reduced the price of most of our products by 5%, hurry this offer cannot last! This offer includes all our Aluminium Windows, our Heritage Windows, Secondary Glazing and even Sliding Patio Doors. This offer does not however include Bi-folding Doors. 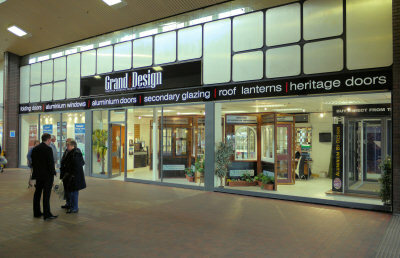 04/03/12 - Are Your Going To Grand Designs Live 2012? Are you going to Grand Designs this year? Why not come and visit us at our Exhibition Centre while you are there. This year we have decided not to exhibit at Grand Designs Live, at the Excel. This is because we don’t need to. We have our own Exhibition Centre, which is just 30 minutes down the road.